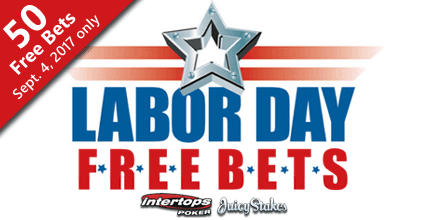 August 30, 2017 — St. Johns, Antigua (Press Release) – To honor the labor movement and the contributions that workers have made to American prosperity, Intertops Poker and Juicy Stakes are giving all players 50 free bets on casino games on Labor Day. Intertops Poker and Juicy Stakes are the busiest poker room on the Horizon Poker Network, making them popular with poker players all over the world. They’re also well known for their selection of online slots and table games from World Match, Lucktap and Betsoft.